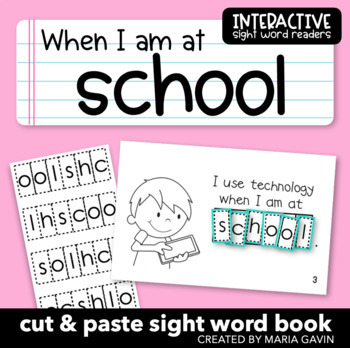 Interactive Sight Word Reader "When I am at SCHOOL"
Interactive Sight Word Readers allow students to read and spell sight words in a meaningful and engaging way. This is an emergent reader to help students learn to read and spell the sight word “school” in a hands-on way. 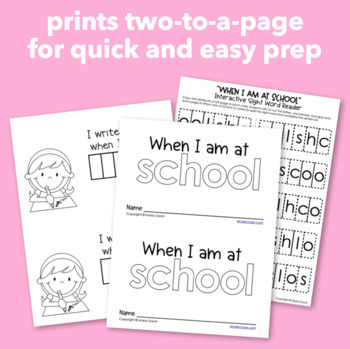 Each page of "When I am at School" contains a predictable sentence missing the word “school” Students will cut apart the letters to spell “school” (included), then unscramble and glue the letters into each page to correctly spell the sight word. Each page of the booklet also features pictures to support the text. 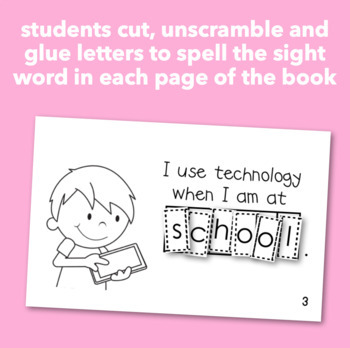 Copy "When I am at School" book and the corresponding scrambled word cutouts for each student. Separate book pages by cutting each 8.5x11” sheet in half and staple the books together for students. You can separate “school” cutouts and distribute 1 word at a time in class, or provide students with full sheets of cutouts for a Literacy Center. Have you discovered the Bundle of Books? 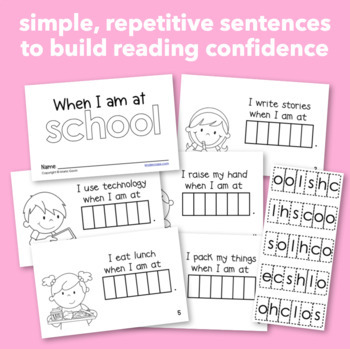 It contains 100 of my best-selling Interactive Sight Word Readers Sight Word Readers at a savings of 50%. Save BIG... buy the Bundle of Books! Want to know about my Interactive Sight Word Readers? This blog post will answer all of your questions. Images Copyright © Kari Bolt. All rights reserved.